The spatial distribution of molecules throughout a sample can provide a wealth of information regarding biological, physiological, and chemical phenomena and processes. One of the most recent and exciting developments in the study of molecular distributions has been the use of mass spectrometry (MS) to specifically measure molecular targets in order to determine their distribution within a sample. While MS can be a powerful technique for imaging, there are limitations to the types of molecules that can be analyzed and the depth of information that can be obtained using any one MS imaging technique alone. 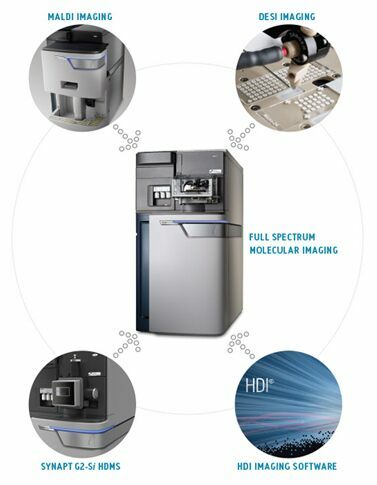 To overcome the deficiencies of any single imaging technique, Waters has integrated a number of MS technologies (matrix assisted laser desorption time of flight, desorption electrospray ionization, ion mobility, high performance quadrupole time-of-flight) to create Full Spectrum Molecular Imaging, enabling complementary MS imaging techniques on a single instrument platform. By taking this approach, a much greater level of molecular detail can be extracted in order to construct a more complete and comprehensive picture of the sample, including the molecular distribution of a variety of molecule types including small molecules, drugs and metabolites, lipids, and peptides. Particularly well suited to studying the distribution of small molecule targets, Full Spectrum Molecular Imaging represents a significant advance in the ability of MS to perform molecular imaging studies. Waters has spent substantial effort optimizing and improving both the instrumentation and software that is so critical to collecting and interpreting molecular imaging data. These enhancements have not only improved the analytical performance of traditional MS imaging techniques, but have also greatly enhanced the robustness and usability of MS for imaging studies. Although imaging has already been an important application of MS, until now the realization of its full promise and use in routine studies has been a challenge. Enhancements to the instrumentation, software, and the imaging techniques themselves have all been required to bring the promise of Full Spectrum Molecular imaging to fruition. Written by Darwin Asa, Senior Marketing Manager, Health Sciences, Waters Corporation. This article was originally published in Pittcon Today on Wednesday, March 1, 2015.